A brief dictionary definition of eschatology is, “The branch (of theology) that treats of death, resurrection, immorality, the end of the world, final judgment, and the future state” (Funk & Wagnalls). R. J. Rushdoony never studied the principles of corporate branding, but he provided you and me with a clear and distinct vision for the cultivation of Christian civilization. He illustrated the glorious picture of the triumphant Christ and the active role of His royal priesthood subduing all spheres to His kingly rule. Abomination of Desolation. A phrase deriving from Daniel (9:27; 11:31; 12:31) which is cited by Christ in His Olivet Discourse (Mt. 24:15). We live in a world suffering great trials and tribulations, natural and human, legal and moral. Classic dispensationalism was born in England in the 1830s and popularized in America by William E. Blackstone’s book, Jesus Is Coming Again (1878), and by the footnotes of the Scofield Reference Bible (1909). Postmillennialism is a doctrine that instills hope for the future. Other eschatological views will, no doubt, say that they also give a vision of hope for the future. The Great Tribulation occurred in the first century during Roman emperor Nero’s reign. Dispensationalism could not have given birth to America. 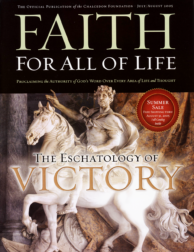 Death of the Church Victorious is a frightening book, one that shows how far the church went off the track during the 19th and 20th centuries. One of the more familiar topics in Christian prophecy discussions is the millennial reign of Christ mentioned by John in Revelation 20:1-6.